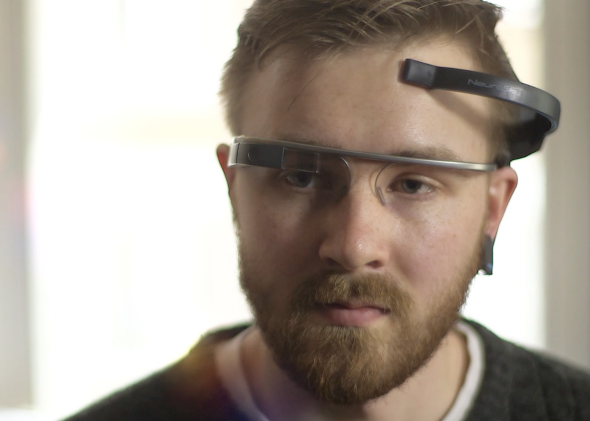 Google Glass MindRDR app: No, EEG headsets can't read your mind. Let me guess: You’re thinking about taking a photo and posting it to Twitter? It’s a rhetorical question, but that didn’t stop a London-based digital studio from providing us with a definitive answer. That answer, of course, is yes. Yes, they could make it harder to operate Glass—by hooking it up to a headset and an app that tries to infer your intentions from your brain waves. The app is called MindRDR, and it relies on a Neurosky electroencephalography sensor to detect changes in the electrical signals emanating from your brain. Concentrate hard enough, and Glass will take a picture of whatever it is you’re looking at. Concentrate even harder, and it will post the photo to Twitter or Facebook. That’s literally all it does. As I’ve explained several times, and am now resigned to keep explaining until either I die or the technology fundamentally changes, EEG headsets cannot “read your mind” any more than a toddler can read Finnegans Wake. At best, they can make crude inferences as to whether certain regions of your brain (mostly those near the surface) are more or less active than usual. At worst, such signals are overwhelmed by interference from ambient electrical noise, or even the headset-wearer’s muscle twitches. Neurosky’s software works hard to filter out that interference. But it can’t begin to differentiate between your intentions to take a photo and your intentions to, say, search Google for the nearest Thai restaurant. That’s why MindRDR only does one thing. I’ll admit I haven’t yet had the chance to try MindRDR, but I have tried the underlying technology. And I find it impossible to believe that concentrating really hard while wearing a second, $80 headset in addition to Google Glass represents a “viable” way to do anything. EEG headsets have their potential uses, but controlling complex, multi-functional electronic devices with any sort of precision is simply not among them. Buttons are viable. Touchscreens are viable. Voice control is getting more viable all the time. Heck, even jerking your head upward like someone who just awoke from an inadvertent nap is more viable than this. Sorry, Glass wearers: If you want to take photos and post them to Facebook, you’re going to have to keep tapping, clicking, and swiping those frames for the foreseeable future.